Elite Screens, Inc. an innovative company that specializes in quality projection screens, today announced its partnership with Advaning Awnings and Shades, a professional awning company to bring you the Yard Master Awning Series free-standing outdoor shade that doubles as a large outdoor movie screen after dusk. Outdoor events should never end at sundown. It takes a lot to bring a big family and old friends together so why not add a centerpiece to your outdoor ensemble that has it all? 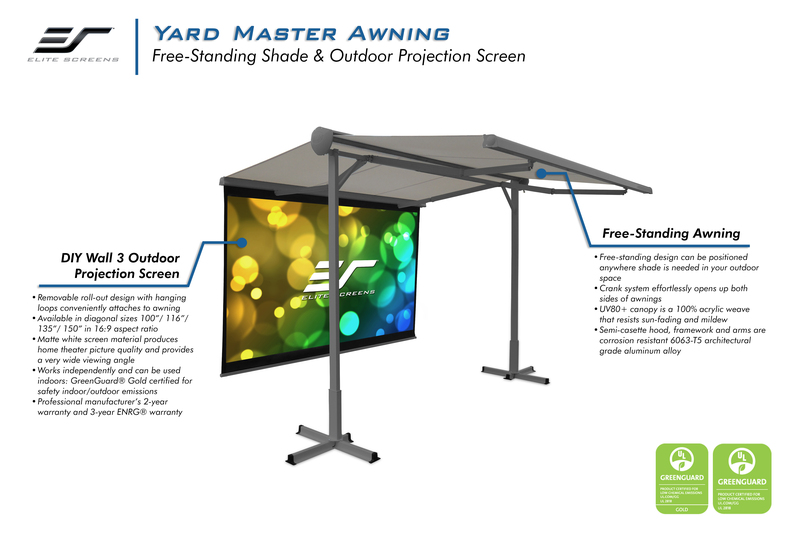 Elite Screens has partnered with Advaning Awnings & Shades to bring you the Yard Master Awning Series. This is a Free-Standing retractable sun shade to keep your backyard events comfortable in the heat of the day. When night falls, it becomes the ultimate platform for a large outdoor theater display ranging from 100”-150”. This is the ideal size range to entertain your guests, your neighborhood, and anyone else who should drop in. The Yard Master Awning Series is a dynamic free-standing sun shade that is easy to integrate within your exterior retreat which is ideal for either a hospitality or residential environment. The design features a manually operated semi-cassette format that projects a pair of opposing retractable canopies. Its simple design utilizes a hand-crank operated mechanism that requires little effort. The design is also easy to assemble in just minutes. The materials incorporated in the construction of an Yard Master Awning Series are of an exceptionally high quality. The canopy is of a UV80+ sun protective 100% acrylic material. This is a weave fabric that is highly resistant against sun fading and mildew. The Yard Master Awning Series canopy is superior over vinyl and polyester because it will not trap heat or moisture so as to ensure a more pleasant shelter through the heat of the day. The metal components uses a superior grade of corrosion resistant 6063-T5 grade aluminum alloy for the semi-cassette hood, aluminum lateral arms and front bar counterweight. The lateral arms are also inlaid with twin 316 marine and architectural grade stainless steel cables that offer superior strenght and product longevity over traditional powder-coated steel cables. With a strong dedication to high quality in a package that is both aesthetically pleasing and easy to use, Advaning’s Yard Master Awning Series is the ultimate centerpiece for your next outdoor event. The DIY Wall 3 Outdoor Projector Screen comes as a detachable module that uses Elite’s MaxWhite® B theater grade 1.0 gain matte white material. The screen is a Greenguard® (UL 2818) certified, 4K Ultra HD, Active 3D, and HDR Ready projection surface that is ideal for use with standard long-throw projectors. It’s support bars maintain stability during presentations and is compliant with all of the high-resolution standard “long-throw” projectors on the market today. The projector screen is available in an HDTV (16:9) aspect ratio with sizes ranging from 100”-150”. Elite Screens’ Yard Master Awning Series is available now with a starting price at $1099 (USD) and is available through the retail sales channel. Yard Master Awning Series stands 8’3” tall with an open span of 10’. Lengths come in 10’ to a 14” with options of a 100-150 HDTV (16:9) screen sizes to choose from. It comes with Elite’s 2-year manufacturer’s warranty and a 3-year ENR-G warranty for Educational, Non-Profit, Religious and Government/Military organizations.